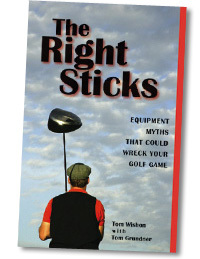 The Right Sticks: Equipment Myths That Could Wreck Your Golf Game has all the ingredients to be the most successful Wishon book of all for enhancing the image of professional clubfitting and generating demand for Clubmakers’ services. The Right Sticks: Equipment Myths That Could Wreck Your Golf Game is short, sweet and gets specifically to the point in shattering 37 different golf equipment myths perpetuated by the huge marketing campaigns of the standard club companies. The Right Sticks: Equipment Myths That Could Wreck Your Golf Game was created in response to demand from the major bookstore chains for an expanded version of Wishon Golf’s booklet, 12 Myths That Could Wreck Your Golf Game. When all the major bookstore chains saw the 32 page 12 Myths booklet, they loved the content, loved the 3-4 pages per myth style of writing, but wanted the content of the equipment myths to be expanded to around 100 pages. In short, Wishon’s newest book has been created to appeal specifically to readers who want information in a short and easy to read format. The second longest hitting club in your bag is your 3-wood. There is no way a club’s design can reduce your slice. Only lessons can do that. The shaft is the engine of the golf club. The shaft acts like a buggy whip. It gives additional speed to the ball with its last second snap. The longer the length of the club, the farther you’ll hit the ball. Graphite shafted irons need to be longer than steel shafted irons. Women’s clubs are designed for women. Senior golfers need to play with senior clubs. the arrow, it’s the archer.